I bought a new set of 50 Crayola colouring pencils a couple of weeks ago to work on some illustrations and I haven’t been able to put them down since. New art materials are a bit like sweeties to me and if fancy art pencils are high-end chocolates then Crayola pencils are Pick n’ Mix. I’ve been trying to learn a bit of the native language whilst I’m up here. I’m desperately bad at it, there’s something about Gaelic that seems more tricky to pick up than other European languages. Somehow the words wont stick to my brain cells. The ultimate in linguistic Teflon. It’s quite a gutteral language, very different from French or Spanish, and apparently German visitors find it easier to pick up than the rest of us. It’s a funny one to hear spoken (I find myself stretching to try and hear familiar words) but it’s hauntingly beautiful when sung. The signage around Skye is a helpful way to learn a few basic pronunciations as the Gaelic place names are usually written in green above the English ones. I love seeing how some of our everyday Anglo words have been integrated into the Gaelic language with terms such as ospadal (hospital) and oifis a’ phuist (post office). Perhaps I’m easily pleased but I love that. 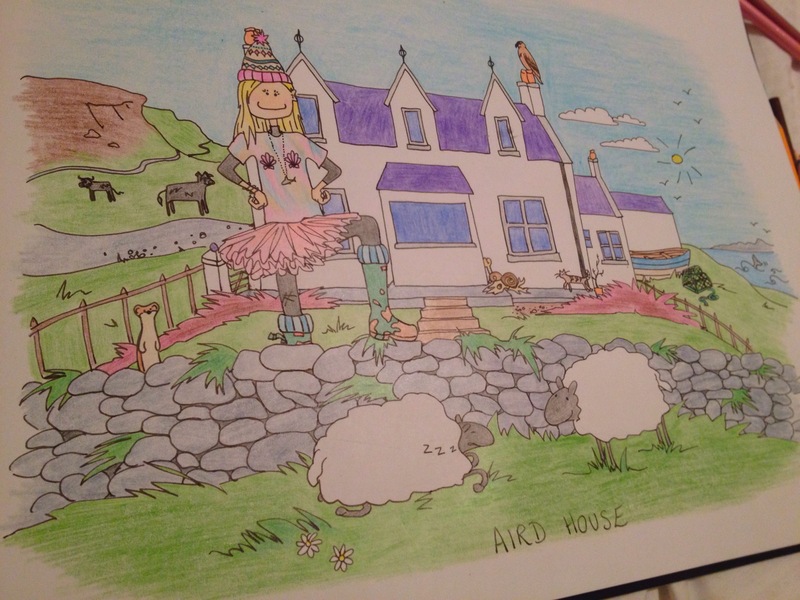 This entry was tagged Art, artist, colouring in, confectionery, Cottage, doodle, drawing, Gaelic, House, illustration, Katie, language, me, signs, Skye, sweets. Bookmark the permalink. I can relate to your new crayons, I know it’s sad but I get so excited when I buy a new pencil, my latest simple pleasures are Derwent Inktense, or a lovely hand stitched and bound drawing book, yummy! 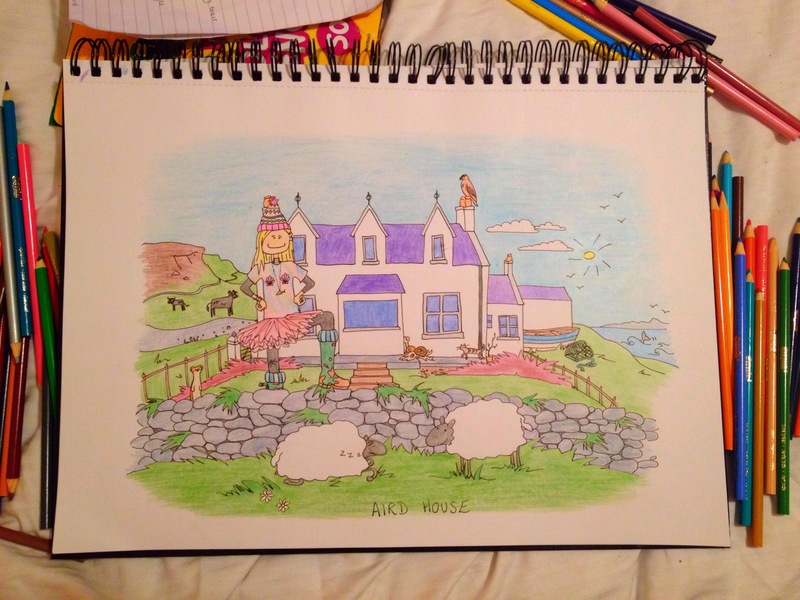 Love your jolly illustrations and the little Gaelic lesson, I need to remember Suiteas as I have a sweet tooth!